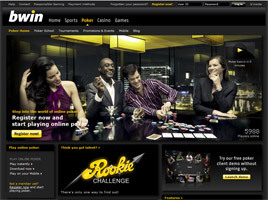 New players are invited to participate in bwin’s "Rookie Challenge". It is a freeroll tournament with real money tournament tickets offered as prizes. Although no cash bonuses or deposit matches are offered to poker players, those who sign up initially through the bwin Instant Play or Download Casino and open their accounts with at least €10 receive a 50% first deposit bonus of up to €200. The compendium of gaming web pages owned and operated by bwin International Ltd. is licensed and regulated by the Government of Gibraltar. It includes sections for Sports, Casino, Games, and Poker. The bwin Poker page is a portal for access to competition within the Ongame Network of some 16,000 players. The bwin software, which comes in both downloadable and instant play versions, features highly sophisticated graphics and audio. Poker games are denominated in U.S. dollars, although deposits can be accepted and withdrawals made in a wide range of currencies. English is the primary language, with a mirror site up and running in French. To help players get started, bwin Poker offers a “Poker school” that provides a tutorial on how to use the poker client software. It also features basic instruction on hand rankings and how to play No-Limit Texas Hold’em—the site’s most popular game. For more experienced players, there are lessons to assist in improve their game by learning more about strategy and betting. And for those in a hurry, a video clip called “Poker Basics in 5 Minutes” will pop up upon clicking the image on the main page. The newly designed lobby area provides up-to-the-minute tournament data. It displays ranking lists, prize structures, add-on and re-buy info, and blind level information, along with a real-time table preview. There is also a new “direct seating function” that allows players to be seated immediately at tables without even opening a table. Games available on the bwin Poker site include Omaha, Omaha Hi/Lo, Seven Card Stud, Seven Card Stud Hi/Lo, and Five Card Draw, in addition to Texas Hold’em. All three of the most common wagering formats are available: Fixed Limit, No Limit, and Pot Limit. One convenient feature for anyone interested in testing out the site is a free demonstration. It pops up window showing a table for six-handed Texas Hold’em, no limit with $10/$20 blinds, and starts the visitor off with a $1,500 bankroll. The play is quick, as might be encountered in a real game, giving a good feel for how the software plays. Every Monday evening there is the “Weekly Country Showdown” with a guaranteed $3,000 prize pool. Another popular tournament is “Double or Quits,” a twist on Double or Nothing that allows a re-buy within the first 30 minutes so that players eliminated before the top five get a second chance to make the money round. Sit & Go tables are always open, too. Players who refer a friend to bwin get a Friendship Bonus, which includes an extra $30 poker bonus in addition to a €15 sports betting bonus. The friend who is referred is given the same deal. Players are also automatically enrolled in the bwin Poker Point program, which is the site’s loyalty scheme. During the course of play, Poker Points are awarded for participation in cash games and tournaments. The points can be used to unlock bonuses or redeemed through the “b’inside” web site for a wide variety of prizes. Five Poker Points are collected for every dollar paid in tournament fees. Additional points are earned in cash games, based upon the size of the pots played for, number of players participating, and the table stakes. The Market section of b’inside is where points are redeemed. The pages of prizes are divided into for sections: Gadgets & Stuff with innovative products for daily use like laptop computers and flat screen TVs; Outfits & Trends with apparel from t-shirts to shorts; Change & Challenge offering sweepstakes, real cash packages and poker tournament tickets; and Sports & Poker for everything related to those categories, including poker chips and even billiards tables. Travel packages are often available, too.